For some time now my dear friend Greg Basco and I, have been talking about how much fun it would be to photograph the whole process that surrounds coffee, of course, always over a cup of coffee. Well, this rainy season is all about making it happen (for example, he just renew his website, you should absolutely go check it out) . So while he was all busy figuring out the Internet, I sat down and though about what would make a coffee photo tour successful. I think I got it, but I am going to let you decide! Foto Verde Tours has been growing a lot, and part of that will show when Greg finishes the new website (also very exciting). But since we wont be able to show you that improvement for a few more days, we are at least going to show you in here the Coffee Photo Tour that we have putted together. If this is something that you would definitely want to do, let me know! I will make sure to put you on the list, and as soon as Foto Verde’s new website is up, we will finish the sign up process. Let’s meet soon over coffee!!! The coffee fields are a beautiful landscape. If you are a coffee lover, this short itinerary will give you the opportunity to learn more about coffee and to put into practice the documentary photographer in you. 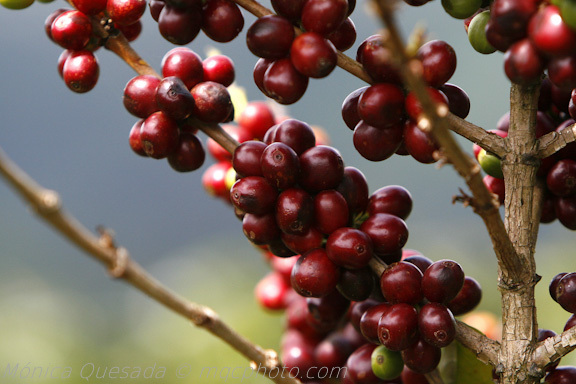 We will have the opportunity to photograph everything about coffee: from the plant to the cup, all of it in the spirit of sustainable agriculture and production. 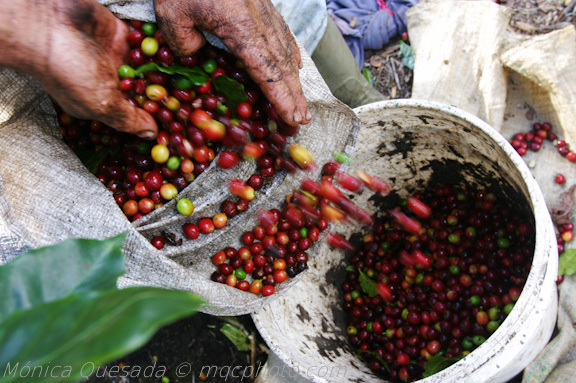 The itinerary will be divided in 4 sections: first, we will have the chance to photograph the life of a coffee plantation during the harvest season; second, we will have the opportunity to photograph the processing of the coffee bean, both in the traditional way and a more industrial environment. And third, we will take time to produce an impeccable picture of a cup of coffee, as if we were commercial photographers on assignment for a coffee seller. All of the places and processes that we will photograph are certified by the Rainforest Alliance as sustainable production so, while photographing, you will also help to protect the rainforest and the economies that develop around it. Since you are visiting one of the most biodiverse countries on Earth, it would be a shame to return home without some images of our colorful plants and animals. So, we will take a day to visit the La Paz Waterfall so that you can capture great images of frogs, butterflies, hummingbirds, tropical flowers, beautiful waterfalls and some beautiful rainforest cats that are in captivity as part of a rehabilitation program. To practice approaching people when doing documentary photography. To learn the use of fill flash when photographing people. To learn the use of wide angle lenses when doing documentary photography. To learn good editing practices when defining a documentary photo essay. To learn about food styling and food photography by photographing the final product: a cup of coffee. Digital camera (SLR, advanced point and shoot). Wide angle lens (16 to 35mm) medium and long lenses. Flash transmitter or Off-Camera shoe cord. Comfortable and small bag for walking with camera equipment. Arrival to San Jose and private transfer from airport to the Hotel Buena Vista located in the province of Alajuela, north of San José in the highlands of the Central Valley where the weather is cool and agreeable year-round. Your trip leader and photo instructor, Mónica Quesada of Foto Verde Tours, will be waiting for you upon arrival at the hotel. After an early breakfast, we will visit the coffee plantations that belongs to Doka Estate, the Santa Eduviges Plantation. This plantation belongs to the Vargas Family of San Isidro of Alajuela. The grandfather, Clarindo Vargas, started as a coffee farmer in 1931, after having a store and a dairy farm. Today, his six children and his grandchildren at the head of 200 fixed employees and 3000 temporary employees during harvest time, work an area of 2000 manzanas of planted coffee, the equivalent of 1600 hectares of land. 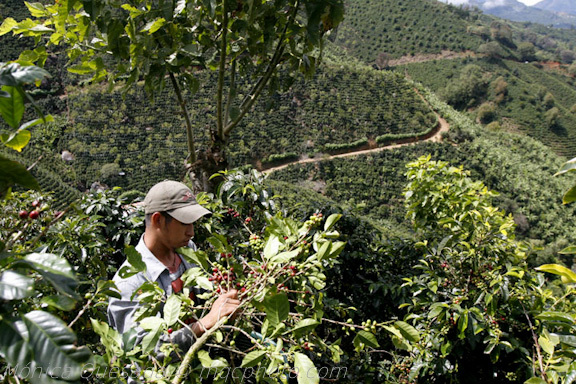 This plantations is certified by Rainforest Alliance. We will spend the entire morning getting to know the plantation, photographing the landscape of the farm and the coffee trees filled with fruit ready to be picked. This morning will also give us the chance to approach the coffee pickers and to start a relationship with some of them, so we will be able to follow them for the next day and a half photographing their work, when they rest, relate to other coffee pickers, etc. We will have lunch at La Cajuela Restaurant, inside Doka Estates, but first we will have a session to discuss the experience of approaching people in the morning. Monica will talk about different experiences of legendary documentary photographers like Robert Capa, Dorothea Lange and Robert Frank, and some other famous working documentary photographers. We will talk about their techniques approaching people, and learn some tips that we can use on the afternoon session. After lunch we will go back to the coffee farm to photograph more of its life. We will return to the hotel around 4pm and have a quick individual editing session form the pictures taken during the day; that way we can have a better idea of elements that are missing or could be improved the next day. Around 6:30pm we will leave for a restaurant on the hills of the mountains to have dinner and enjoy the view of the Central Valley. Since much of the coffee plantations in Costa Rica are located in the rich soils of this valley, a picture of it illuminated at night will add a very nice artistic touch to our photo essay. Today we will devote all of our time and creativity to photographing the coffee plantations and its workers, from early morning, until they leave late afternoon. 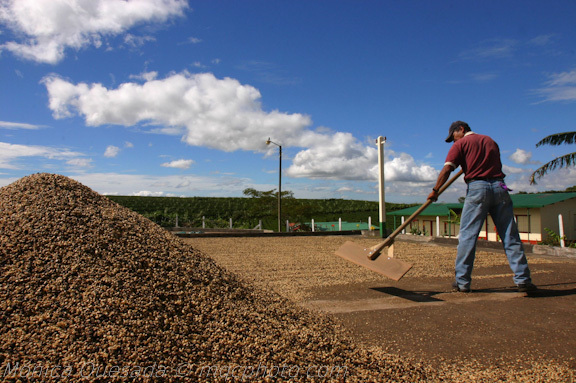 We will concentrate on getting as many aspects and different angles of the process as possible, so we will have a lot of material to choose from and develop a very complete and interesting photo essay of coffee in all of its facets. We will have lunch at La Cajuela Restaurant, and use this time to discuss more about the experiences while shooting. Monica will also take advantage of this time to discuss the process of editing a photo essay. At the end of the afternoon we will take a break for a couple of ours from the coffee photography and we will spend some time at the Doka Estates’ brand new Butterflies Garden. After this break we will return to the hotel for more individual editing sessions and to enjoy dinner. We will take a small break from coffee on our third day to visit La Paz Waterfall Gardens. Nevertheless, on the way to this interesting attraction, we will stop to photograph some more landscape of different coffee plantations. At La Paz Waterfalls everybody can choose his or her favorite subjects, from butterflies to waterfalls, and use their time to photograph what most interests them. Monica will be floating around the Waterfall Gardens to help you with tips in order for you to get the best pictures possible. We will have lunch at the restaurant of La Paz Waterfall Gardens, and we will return to the hotel around 4pm. On our way back we will also stop for more landscape photography of the Central Valley and coffee plantations, this time with the beautiful afternoon light, and hopefully one of the impressive sunsets that can be seen in Costa Rica this time of year. After dinner, we will have a photo review, where everybody can show their coffee plantation photo essay, and also show some of the nature photographs taken during the day. 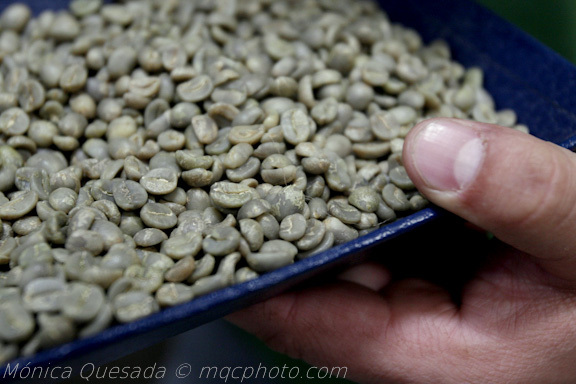 Today we will discover and photograph the second step in the production of coffee, the beneficio de café (coffee brokerage) that also belongs to Doka Plantations. 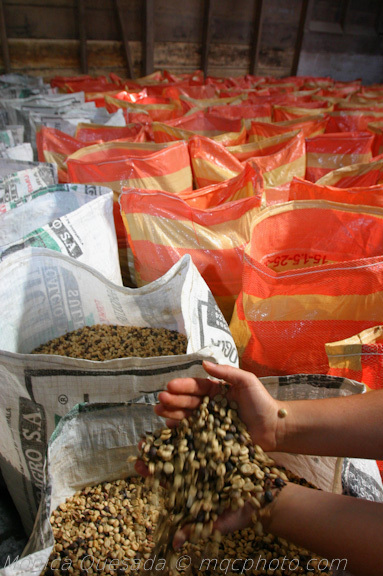 Their coffee brokerage was founded before they started in the business, and that today it is the oldest still functioning brokerage in the country. Inside the beneficio you can still find the original machinery and the architecture has not been changed since its construction, that is why it was declared Historical and Architectural Patrimony by the Government of Costa Rica in 2003. 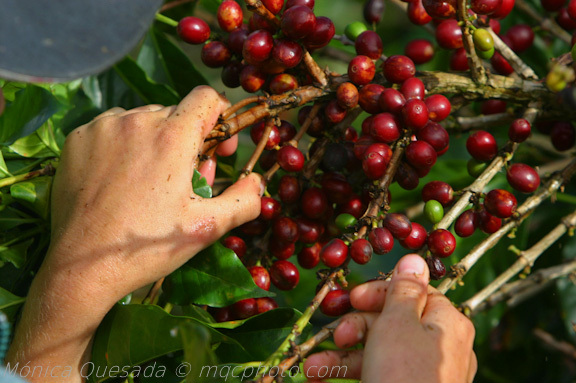 At this coffee brokerage we will photograph the places where they receive the coffee, the transport of the beans into the machinery that will peel and select the beans. Also we will photograph the traditional way of drying the coffee beans, at the sun-drying courtyards. After, we will photograph the process of toasting the coffee beans. At the end of the day, we will have a coffee tasting organized by Doka Estates, where we will learn about the different types of coffee that you can find under their brand and its particular taste. We will return to the hotel to edit and add the pictures taken today to our coffee photo essay. Hotel Buena Vista or similiar overnight (B,D), Lunch at the Doka Plantation State. Today, we will spend the morning producing a picture that will make people want to drink coffee. By using small studio lights and props provided by Monica and Foto Verde Tours, each person will have the chance to be the photographer of a commercial production, and everybody else will take turns working as photographer assistant, light technicians, food stylists and props responsible. By lunch, we should all have a very nice looking photograph of a cup of coffee to seal the deal on our coffee photo essay. After lunch we will finalize the details of our photo essays and get them ready for the final slide show. Do not forget to choose some music that can be added to your essay. The farewell dinner will be held at the Finca Rosa Blanca hotel, and after the dinner we will all enjoy the presentation of the photo essays with a good cup of coffee from the plantations we have photographed the past few days. Departure day. Private transfer from the Hotel in Heredia to the Juan Santamaría International Airport.